If you have been a fan of Manny Ramirez like I never was you might like to know that he is going to be playing baseball in Taiwan. The has been ball player will be making 25k a month I wonder what he is going to blow it on. Just to show you that he is a “has been” player is that he went 1-17 in the 2011 season with the Tampa Bay Rays. I am a fan of baseball but this guy is just milkin’ the system I mean he’s 40 years old put the bat back. 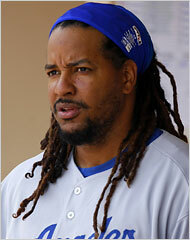 Manny Ramirez is back in a uniform but in Taiwan have fun going 0-17 bro!